Height: 6’6” Weight: 250 lbs. Skills and abilities: Menthu, as a sun god, is able to manifest light, as both particles & as waves. With concentration, he is able to manifest light particles into solid objects, manipulate & move light (creating localized spots of shadows or brightness). He can—with concentration—bend light waves to enable himself to see something “invisible” & to temporarily make invisible a “seen” object (though this is tiring for him to do). 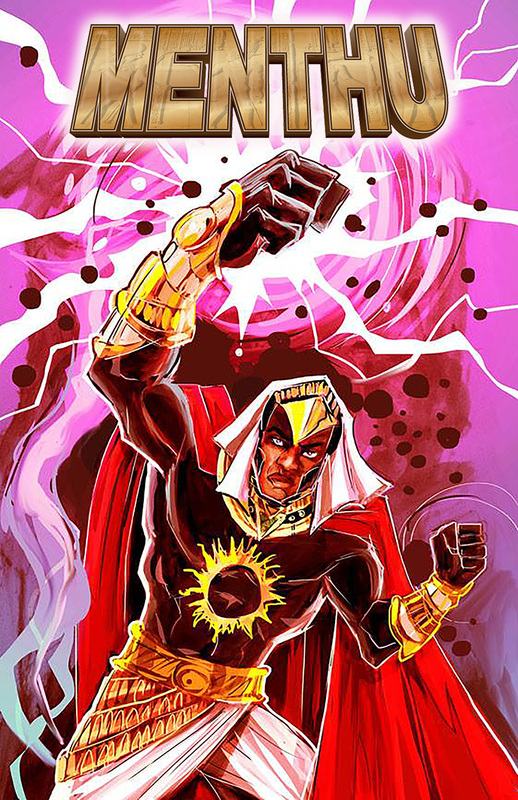 Powers: solar-based; super-strong; super-fast; flight (up to 25,000 miles per hour on Earth [dealing with friction, gravity & such]; 3X this speed in space); in future storylines, Menthu will learn that he can become one with light, enabling himself (& a limited amount of IMMEDIATE fellow travelers—not more than 3 or 4–or not-too-heavy objects) to move at the speed of light. Again, such an effort is temporarily taxing. He can generate & control concussive or plasma “sun bolts,” which emanate from his hands. (NO BEAMS FROM HIS EYES.) Being an Egyptian god’s offspring & also receiving a past god’s latent abilities, Menthu is among the most powerful of the Egyptian pantheon’s immortals. As such, he’s sometimes caught up in the pantheon’s politicks (though he has no such politicking aspirations). Biography: Menthu is a present-day story based on Egyptian mythology. In it, Rashan N’Shanga, tight end & first round draft pick of his hometown LA Archangels, is about to embark on his professional career when life—both mortal & immortal—intrudes. Upon graduating from college, Rashan learns that he is much more than a talented athlete. Rashan learns that his father was / is actually the Kemetic god of war: Anhur. This alone makes Rashan an immortal. But in addition to this, Rashan also houses the latent faculties of a “departed” sun god: Menthu. This makes the young man doubly powerful. And it makes him doubly dangerous to his potential enemies. These enemies include Haitian-born & Vodoun-powered Trouble Man, narcissistically gorgeous & felonious Sirocco, the angel with an attitude, Tzadqiel, the powerful demon, Carniveau, & Egypt’s ultimate immortal of chaos & discord, Set. very impressive, I like this menthu, sounds very interesting. this is what we need, more superheroes that are of a non-wite origin … great work and my compliments to mr. roach.